I have always wanted to travel and see new cultures, and for the first time I am truly getting that opportunity. NanoJapan is a program that not only gives me the chance to see, but to engage and be a part of the culture. I can create long lasting connections and friendships with people who come from completely different locations and backgrounds, something much more rewarding than tourism. It is these kinds of cross-cultural connections that will be important for the fields of science and engineering, and I am just fraction. The world is becoming more globalized, so the ability to communicate between cultures will become more important for the progress of technology. The sharing of information and knowledge is a key for progress. The researchers who collaborate are going to be the ones who will be important and successful in their fields. I applied to this program because I do not want my education to be static. Japan will provide me with a unique research experience, add to my current laboratory skills, and give me a broader range of possibilities for my future research. What I am really excited to learn is all the things I will learn outside of the lab: the experience of living in Japan excites me the most. I have been in Tokyo for three days now, and I have to say that it far exceeded expectations. I love the city: it’s the best city in the world. I will not lie, It is rather difficult to communicate to the local people, but it is not as much of a hindrance as I expected. I expected to be completely lost and confused the whole time, but between the little English that they know and the small amounts of Japanese I know, it’s rather easy to get your point across using pantomime. I do feel like a fool when I try to communicate, but it’s the best I can do at the moment. A few guys and I went to a sit down restaurant for dinner and we got some okonomiyaki and noodles. The waitresses did not speak a word of English and it may have been the most difficult ordering experience ever. We tried saying something, she tried saying something and a blank look came over all of our faces, that “no clue what’s going on” look that I recognize on the other NJ students faces in our language courses. It’ll be stressful overcoming a language barrier, but not impossible. This ad completely sums up my attitude. I’m in complete awe of Tokyo and Japan in general. I love it. I will say that learning Japanese is much different than any other language course that I have ever done. It is really intense. It’s amazing how much I have learned in three days. Over 10 hours of class work, and I already feel like I know some Japanese. I still have yet to have a real conversation with a Japanese person in Japanese, but I still have time. Also, being in the host country increases the drive to learn the language. Studying French in high school was fun, but I never had a desire to learn the information other than for the purpose of trying to pass the class. Its easy to pick up on the structure of the language, but being able to remember the words at the proper time seems impossible in such a short time. It’s not like French or Spanish where many of the words are the same or really similar, everything is new. I loved meeting the Japanese students from KIP. I thought that the first meeting with them was great, and I cannot wait for session number two. All of them were fun to talk to and fun to hang out with afterward. It was nice to have a chance to meet people from their culture. Engakuji Temple in Kamakura – I like this picture because I think it really captures the beauty of Japanese culture. It’s like something out of a movie or on a post card. Based on what I have observed in the subway thus far, my opinion is that there are quite a few differences between the cultures. I have not had that many experiences with subway systems in the states; I have been on the Chicago “L” a few times, but I really never paid much attention to my surroundings. I will say that overall, the subway here is much cleaner, and people are generally much more respectful. First, the level of cleanliness in the subway is analogous to the level of cleanliness everywhere in the city. I have seen maybe three homeless people on the streets of Tokyo so far; in Chicago, it’s like three per minute. It is a similar situation in the subway. The seats are cushioned and always clean. There’s no gum on the seat, or windows, or support bars. Nobody has taken a sharpie, and drawn a mustache on the Docomo advertisement guy. There is just an overall lack of hooliganish activities in Japan’s largest city, which I find incredible. I think that shows the level of respect and pride for their home which people have here. Along with my last point, the level of comfort I have in a Japanese subway greatly outweighs how I feel in America. There could be 100 people crammed into one subway car, but I still have a greater level of comfort than being on a subway in America where I get my own bench. It’s because I’m not paranoid in my surroundings. No one will hassle me for money, or try to sell me something ridiculous; I can get from point A to B without any issues or problems. The biggest problem in Tokyo transportation at the moment is stalking. A crime not even discussed in the US because we have far worse issues to deal with. I guess the only drawback to the structural transit system is that there is not the same level of entertainment on the subways I find back home. I am not going to see someone get up and start rapping for a dollar, or see a showdown between a grandmother and a teen for the last seat. But, I guess you just can’t have everything. STS-Elionix Company Visit - The Reason We’re Here: We wouldn’t have been considered for this program without a strong background in a STEM field. This picture is a good capture of the interest that technology that we all have, and the rigorous program that NJ is. There is so much work that we do here. Sumo! 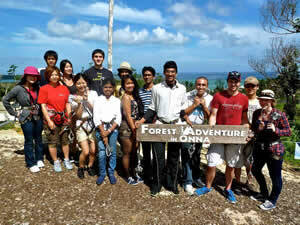 – I had so many great photos to choose from that really reflected the close group that we NJ students have formed. 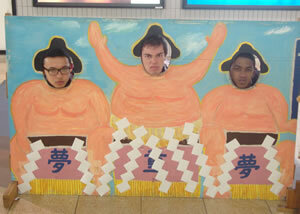 I think we’re all really comfortable with each other and have formed a family here in Japan. The only reason why I chose this one is because of the context of the surroundings. We’re the Same Team - I had to send a photo with Teppei-san in it. He’s really become one of my best friends in the last week, and I think this picture demonstrates one of the main themes of this program, building those cross-cultural bridges. It will be difficult to explain Minami-Sanriku because it will not matter how I describe it. Unless a person saw the area and talked to the people, they will not understand. The condition of the town would lead someone to believe that the tsunami happened a month ago. What used to be the downtown area is now just an uneven layer of concrete with a shell of a building in the center, which has become a place of mourning. The canal that runs through was filled with debris. The men, when they talked about that day two years ago are still almost in a state of denial. The way that they spoke, it sounded like they were clinging to their shattered dreams of “what I would be doing if it didn’t happen.” What did give me hope however was playing with the kids. There is a way to forget about everything else going on around you, and the way is Japanese dodge-ball. They did not seem affected by the destruction surrounding them. One little girl who I spoke to (a KIP member translated) actually said she liked it in the temporary housing because all of her friends are so close. Minami-Sanriku: This picture is a good representation of what this town looked like. 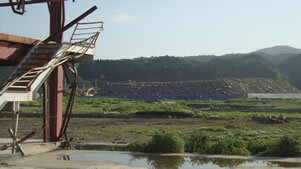 One frame of a structure which has become a site for mourning, and just a mound of rubble. Before 3/11, I’m pretty sure this was downtown. I did not really know what to expect. I will say that the town was still functioning very well. It did not seem like the entire economy had halted. Right before we left on Sunday, there was a small festival near the broken bridge with tents and vendors. There was a stage with traditional dances and songs. It was marvelous to see. 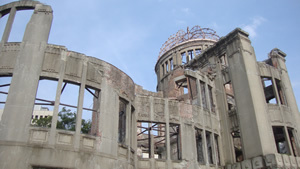 I don’t think it is possible to understand Japan today, especially politically, without understanding 3/11. Its magnitude on politics is similar to that of 9/11 in the US. Some areas will recover just fine with enough given time. Other areas, not so much; I don’t think Minami-Sanriku will ever fully recover I am afraid. The town will be fine, It’s not going anywhere. But I don’t think it will get back to what it once was. Reflections on KIP and the Orientation Program: KIP has been one of my favorite parts of NanoJapan thus far. The people who I got to know will always be my friends, even when I’m half way around the world. It’s been a blast getting to know them, and a pleasure spending time with them. From a more analytical standpoint, meeting the students gave me great insight into the culture and the people who are apart of it. I think that there were some evident differences such as Americans dominating the discussions; we’d have to shut the NanoJapan students up to let the KIP students speak sometimes. But the truth that I learned is that the subtle cultural differences are not barriers, they are bridges. 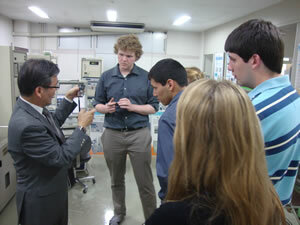 It was fun to learn Japanese slang from the KIP students or hear their differing ideas. It was a great getting to know them and I’m going to miss them. Ron and Taka, one of the KIP students, just being weird together, and it’s awesome. Alone in Okinawa - This is the first of many beautiful pictures sure to come in Okinawa. 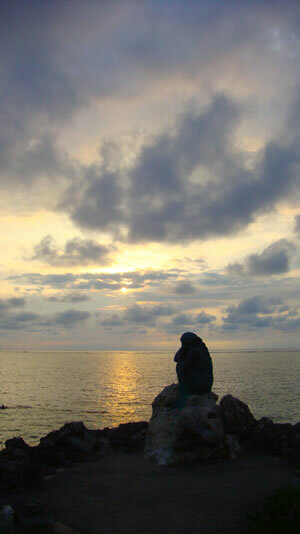 But at the same time, its very solemn with the lone statue by the shore and the sunset in the background. It’s a bittersweet feeling I have right now because on one hand, I have this new adventure, but on the other, I will miss the friends I have made over the last few weeks and I can’t wait for them to join me here in a few weeks. OIST - This place is awesome! My first day here at the Okinawa Institute of Science and Technology was a great introduction to the institute and to the lab. My day started off with my mentor, Pete, picking me up and driving me to campus. I tried to make conversation with him, but I was a little bit preoccupied with staring out the window, and watching the ocean. When we got to OIST, he took me through the university and gave me a tour of the place. He introduced me to the other members of the lab, showed me the section of the building that I would normally be working, as well as showed off the other cool areas of the campus (there are a lot). On our tour, I asked Pete if there are any Japanese courses that are offered on campus, and immediately he took me to see the Japanese language teacher for a quick oral quiz. I tested into Beginner: Level 2, which was on Mondays at 1. So, I went to that course later that day, and was absolutely lost. Luckily, Beginner: Level 1+ was offered directly after in the same room, so I stuck around. That class was a much better fit. Three things that I noticed related to my Japanese language experience. First, one hour for Japanese class seems much too short now. Second, I think its important to note how impressive it is that after 3 weeks of training, I could test into a second year level course. Both of these illuminate just how rigorous and amazing our Japanese classes were. The third relates specifically to my OIST language course. There are 9 students in my class here, all of whom are of a different nationality. Most of the students are learning Japanese through their second language of English. It blew my mind. Anyway, back to the main story. 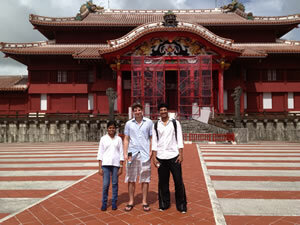 Shuri Castle: My neighbors and I took a trip to Naha to sight-see. Aesthetically, it looks more Chinese than other landmarks that we’ve visited. That’s because it is. The Ryukyuan people, native to Okinawa, had much stronger ties to the Chinese during the time when it was built. The dragons are the Chinese symbol for king or ruler. 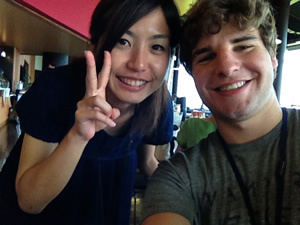 After I was done with Japanese classes, I met my lab research administrator, Yoko-san. She provided me with my badge to get around campus, the bus schedule, tourist pamphlets, etc. She then took me shopping for any items which I needed for my apartment. She let me drive there… not her best idea this year. It also didn’t help that she was yelling “hidari” and “migi” when she wanted me to turn, respectively, “left” or “right”. I think the hardest part about driving is not that you’re on the left hand side of the road, but that all your instincts while driving are programmed the opposite way. For example, whenever I attempted to use the turn signal, I hit the windshield wipers instead, or that I was trying to check my blind spot and kept on looking at the backseat. Onna-son was not a safe town that day. OIST is all in English, but much of the staff are Japanese. So, anytime that I could bust out “yoroshiku onigaishimasu” (nice to meet you). I would get lots of positive feedback, and I could tell they were impressed. Even something as simple as one phase, a phrase we learned the first day, was enough to impress. My housing here is fine, not as glorious as the rest of the place. If I lived in the campus village, it would be much nicer, but I’m not going to complain. It has everything I need: a washer and dryer, a fridge, a/c with a dehumidifier, a shower with warm water. It’s a very livable place that is 5-10 minutes away from a few beaches. It’s also very near to a family mart and an OIST bus stop, so that is also very nice. 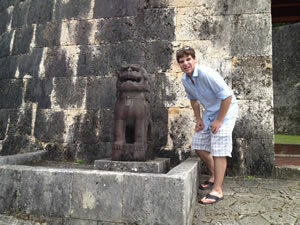 Shisa- Getting acquainted with the Okinawan culture and the shisa (also happens to be OIST’s mascot). Every building in Okinawa has a pair of these it seems like. They are the traditional native “lion dogs” which guard the house. My research project kicked off really quickly, I was trained on the Raman on the 2nd day and by Thursday, we had already taken some good measurements of the sample that we are researching, MoS2. It is a 2D material similar to graphene but it is a semiconductor, so it has different properties and applications. We’re using the Raman to determine the amount of layers found in a thin film sample. Once we have found that, we can start measuring how the samples characteristics are affected by the temperature. We’re trying to set up a system where we can cool the sample with liquid nitrogen (Helium is unavailable), and then record how the sample spectrum changes with temperature. We already have found good areas to measure in our sample. Now we are trying to link the cooling chamber with the liquid nitrogen tank. The parts are incompatible, so it might be rather difficult. The project that I will be working on will use Raman spectroscopy to determine the amount of layers in liquid exfoliated MoS2. Once I do that, I can determine how the temperature may affect the phonon interference of the conduction band. How I can do this is by attaching a liquid nitrogen tank (We lack He) to the sample stage. Attach a vacuum pump to the other end of the stage so that I can control the cooling down the sample as we measure the sample. Besides the methods that I have previously described, I have also been doing some clean room work and possibly making some interdigitated antennas. Later this week I may get some training with the sputter coater and maskless lithography. So, I’ve already gotten a weeks worth of training in on the Raman. I will train all day in the clean room tomorrow on the sputter coater, so that’ll be pretty awesome. After that, I have no clue what I will be doing. Probably Raman spectroscopy and photoluminescence, which I can do with the same equipment and software as for the Raman. I have to admit. I’ve gotten quite good at communicating in a restaurant setting, with the waitresses or the staff. However, once I am out of my element. I don’t seem to know any key words, which makes the situation much more difficult. I’ll give you my most recent example. I just signed up for surf board lessons, which I will take this upcoming Sunday, and to do that, I had to go in and register. The girl working at the surf shop knew about as much English as I knew Japanese. We maybe can form complete sentences, but in a stressful situation. We just try identifying the main words that we hope they understand. There is that initial moment when both parties realize how difficult communication is going to be. It’s usually after the second sentence. There’s this moment where you and the other person stare at each other, and then laugh. It’s not a grand sort of laughter, like your watching a stand-up comedian; It’s the more subtle kind of “This is going to interesting” kind of laughter. I planned on this happening, I looked up a few words that might be helpful in getting my point across, but you cannot plan out a whole conversation and there lies the difficulty. She was asking questions, and I knew what she was trying to say, but I had no way to confirm my instincts. She was asking for my address and I went through 5 different English words before I ever came up with “Uchi” which means home. When I said that word, it was like I had just won charades and she had a small celebration. She had actually gone over to a computer to try and look up the translation, but I figured it out before she ever logged on. I told her my address and funny enough, she also lives in my building. No one got frustrated the whole time. We both understood the situation, and did our best. At the end of the day, that’s really all you can hope for. To try to do your best. Sometimes, it does not always work out, but most of the time, it’ll be ok. I guess we’ll see how well my Japanese surfing lessons go. My intern friends and my expedition to do a Forest Adventure, which includes ziplineing, a high ropes course, and “tarzaning”- an event similar to ziplining but even more fun. Clean Room: This is where I spent two full days last week. I’m not going to lie. I hate the clean suits, but the projects I can do in that room are incredible. 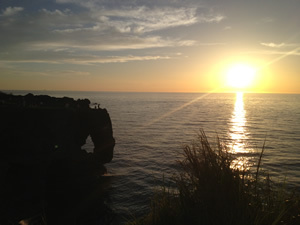 Cape Manzumo: Could be the best sight seeing spot in Onna, especially at sunset. I’ve been set back in my project this last week. My professor and post-doc advisor were both in the US for a conference, and a new instrument was being set up in my lab so I had no space to work on my project. So I’ve been improvising. I went and talked to the other students in my unit. There are multiple labs for my unit, so I don’t have that much interaction with the other students in my unit. But, I asked if I could join them for a project and tried to figure out what they were doing. A little bit of work with Time-Domain Spectroscopy in one lab. They were attempting to characterize a biomolecule, which was interesting. I also went into another lab and got a detailed lecture on the Low Energy Electron Microscope (LEEM). That was really impressive, being able to see the surface of a nanoparticle change in real time as it is being probed. The lab is being set up so that there is a hole in the wall, and they will be able to use the femtosecond laser in one room so that the light will go through the wall and probe the material being studied with the LEEM in the other room. It blew my mind, the level of freedom that they have when setting up their units at this institute. I also did a lot of training in the clean room with the physics resources manager. So I sat in on training for the sputter coater. There were a few bugs in the machine, so a technician from the company has to come and fix it. I also went through the process of making an interdigitated antenna, start to finish. Cleaning, adding resist, E-beam lithography, metallic evaporatory deposition, and finally lift off. I understand the theory behind the method. It’s quite simple actually, but it’ll take time and practice, for me to become an expert on the equipment, so I guess we’ll just have to see what happens. Whenever I get the chance, I have been going to lectures, presentations, and seminars over varying topics. They have so many! I went to reteach seminar last week discussing “Proteins as Dopable Materials” and a video seminar on “Quantum Life.” This week, I plan to attend seminars using LabVIEW and MATLAB, two programs that I should become fluent in, but have had little experience using. We’ll see if the seminars are worthwhile or too advanced for me. I haven’t had a real chance to figure out how to go about cooling the sample yet. It looks like there are more options (new tanks, hopefully one has helium). I have not used this equipment enough to really know how to go about solving this myself, nor do I want to be the intern that destroys the brand new Raman or FT-IR. Not a good legacy to leave behind. I think my cultural reflection is going to be quite different than the other essays that you will read. The difference between my Lab and other labs is not just the fact that mine is international. I believe OIST is different because its really a novel idea. It is not bound by the limitations or structure that many other Universities, either in the U.S. or Japan, are subjected to. The freedom that a researcher has in this kind of environment is enormous compared to conventional institutions. I am an undergraduate, which means in the United States, I’m really not allowed to touch expensive lab equipment unassisted or given the freedom to play and experiment. I am not even allowed to have a key to my lab at SIU in fear that I might come in late at night drunk out of my mind. Here I am trained on an instrument or a procedure, and by next week, I will be all on my own. Running tests or synthesizing materials using many instruments that are worth more than my life. For example, next week, I will be synthesizing THz antennas on my own. The process requires: a maskless photolithography instrument, a thermal/electron beam evaporation system, and a sputtering machine, which was just installed a week ago. All of these instruments, I could never gain access to at my home university, if my university could afford to have them. Because I have such enormous responsibilities now, I have more pride in the research I do here. I think I have the potential to do so much this summer, but I’m limited by time constraints. This week, I have been working more than full time because the procedure which I am doing is very time consuming, and I want to get it done asap, so we can start testing. I also feel more of an attachment to what I do here because it is my job and number one focus, where as during the school year, it’s all about my classes and homework. This story is slightly exaggerated, but the important facts are still there. We were not properly dressed. 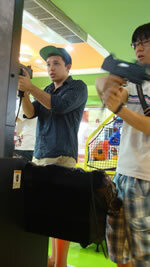 The point is, we were all competent enough to handle the equipment. We weren’t going to be set back on our research an entire weekend because of a stupid rule. It makes things more efficient and I think it creates more independent and bold scientists, since we’re not confined by as strict of rules. American Village: In a town about 30 minutes south, there is this outlet mall called the American Village because it’s surrounded by many American bases and appeals to the demographic. 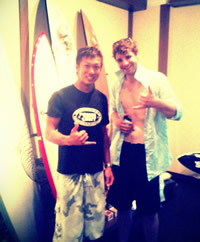 Yuuichi and I: This is my surfing instructor. He was a fun guy to take lessons with and it was kind of interesting to take them all in Japanese. Research Update: It has been an intense ride since Keshav got back. Since then, my efforts and work load has doubled, easily. Advances have been made in both the low temperature Raman experiment as well as antenna fabrication. "This is really just a quick note to let you know that what I think you are doing is not going to work, either for cooling or for stable temperatures." We decided the most effective way was to order an inlet adaptor, so we could attach the correct transfer line to our current dewar. This required me to look into our inventory and find the model types for all of our usable dewars so we could order a proper inlet adaptor. We have purchased the inlet adaptor and the lead time is two weeks. In the meantime, It might be useful to look at our samples photoluminescent properties. Even if it’s not something that we really are looking for with our MoS2, the measurements can still be used to determine the amount of layers, that way we can see how well the data compares. I’m also giving a presentation on MoS2 tomorrow, so this will be good practice for me. I’m expecting to get grilled on questions. Luckily I feel prepared. I’m starting to build my own library of research articles. It’s amazing. As for THz antenna fabrication, Pete and I are working on getting a solid procedure down, now that we have all the equipment installed. We have the ability to create hundreds of antennas at a time. It might be useless, but incredible nonetheless. I’ve done more training on the maskless photolithography instrument, as well as work on a thermal/electron beam evaporator. Once I am competent on the sputtering machine and the surface profiler. I will have all the tools I need to complete the procedure on my own. That way I can manufacture the antennas while Pete tests them. The design element takes place on AutoCAD. Because I was a civil engineering major, I should be much more fluent with this program, but I never took that class. It’ll be fine though. It’s pretty simple to make a design. Once I can envision it, I can easily start varying the parameters and come up with a second experiment that way. I think my biggest accomplishment so far here in Okinawa is research related. It’s not specific to my experimental data, but simply my overall level of work ethic and competence as a researcher that I’ve sustained. I understand what I’m doing, I’m trusted with instruments that undergraduates in the United States normally could not touch, but most importantly, my growth as a scientist and a physicist this summer have been astounding. I know that I will walk out of this summer with so many more skills and assets than I ever could have gained in Southern Illinois. My biggest personal challenge here is having the ability to travel. I don’t have easy access to a method of transportation here, because it’s a bloodbath for the OIST cars on the weekends, and I’m too busy on the weekdays to really do much exploration as well. This limits my ability to experience the culture here, which is disappointing. The focus of the summer is just as much of the cultural immersion as it is the research. Lately, it’s felt a little one sided. My research here is fantastic. My biggest issue will be time; 2 months is not enough time for all the research I want to do here. If I do play my cards right and we don’t run into many more delays (probably not going to happen), I could walk out of this summer with not just one, but two publications. That would be incredibly ideal. But, nothing in science is guaranteed to work out (especially when my procedures take as long as they do and require such high precision). One of my projects on MoS2 has stalled for the moment, because there are required part that I need to connect two instruments is being shipped now. So THz antenna fabrication is my current project, and it’s a tough project to just walk into. I just hope that in two weeks, I’ll have everything done. I’m taking Japanese class twice a week, which means I’m losing skills with time than I’m gaining at this point. There are plenty of Japanese workers here who I’ve befriended and try speaking with. But overall, I’d rate my Japanese speaking ability as insufficient. I’m not forced to use it everyday, so I’m sure that, come the mid-program meeting. I will be able to notice how far behind that I’ve fallen. 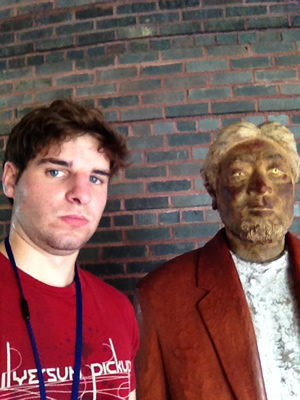 This is a picture of me with a statue that had recently been put in OIST from Okinawa Institute of Art. It randomly appeared one night when I was leaving work after eight. All the lights were out in the corridor except the one directly above his head, so that it created a horror movie worthy scene. It’s eyes are also designed so they follow you no matter where you stand. こわいかったです。This is my picture with him the next morning. Research Update: Last Wednesday, I started work on photoluminescent characterization of our material (just in time to display the results to the lab group that same day during my presentation). The presentation went well. I had to defend an idea or answer a question every slide, so the presentation took almost an hour. It was not exactly what I had expected, but I think I did a sufficient job answering most of the questions. We came to the conclusion that transferring the substrate and taking more measurements would be the key to our success. We’ll look into THz probing. I finally was able to track down the MoS2 and transferred it to the quartz substrate. I then ran some initial PL/Raman tests before I annealed it. I’ll send you those results. I hope to get it measured with terahertz before the end of the week. This project has not been my priority the last week however. Most of my work has been done fabricating antennas. I have a lot of work ahead of me. I’m finally going though the whole process by myself. But I’ll have at least 2 more batches to design, before Peter can test and get the resultant scan. I have also had laser safety training, so although I probably won’t do much with optics here. I do have that under my belt. This last week has been a blur. So much work has gone in, but not enough to have data yet. It’s a slow process, but I’m sure I can get it done. If we create a large enough device, we can test it in one of the lasers to see the magnitude of THz output. That is another paper my name could be on. I’ll start the AutoCAD for that tomorrow. Soon I will know surface profiling. I’ve really enjoyed getting the chance to learn Japanese this summer, although I feel like I could have learned a lot more. The classes in Tokyo were long and intense, but they really helped in the long run. I noticed when I came here that I probably knew much more Japanese than most of the other students at my university because at OIST, everything is taught in English. I would work on my speaking skills with the secretaries and other native Japanese speakers, but since Tokyo, I definitely lost more than I had gained. I did enroll in Japanese classes here at OIST, but 1 hour a day, 2 times a week is clearly not enough time to focus on a language. I was also kept so busy in the lab that I never had any down time to study at work. I’d say, one of the most difficult experiences where Japanese really could’ve come in handy was when I was driving an OIST car during the mid-program meeting, and the front left tire popped. I had no idea how to call or what to do. Dante and I tried asking people passing by, but that didn’t help. I solved it by calling Yoko-san, my research administrator, and she basically did everything for me. She is probably the most helpful person on the face of the Earth. I really want to keep up with my language ability, but I don’t think I’m going to be able to back at my university. I already have a jam-packed schedule in order to graduate on time and adding another class each semester sounds dreadful, but I won’t write it off just yet. Sarah-san getting up close and personal with Okinawa's Habu Snake. Research Update: Last week was my breakthrough week on the Raman. I finally got the inlet adapter that I needed and I was therefore, able to set up and start my experiment. I pulled an all nighter in the lab, just so that I could take multiple sets of data throughout the night. I’ve sent the data to Saikat, so he’ll have a look to make sense of the data that we’ve found. Difficulties as a result of cross-cultural communication are entirely expected at OIST because it is foundation is set as an international university. It strives to bring researchers from different backgrounds to gain a multitude of different perspectives. Communication is part of the daily life and most involve 2 or more different cultures. Everyone knows something might get lost in translation, but being prepared for it helps us alleviate any issues. The most recent example that I saw where cross-cultural differences really resulted in an argument was when a German Ph.D. short-term researcher disagreed on the procedures and methods that we use in our lab for laser safety. I have noticed that our laser safety rules are a little bit more relaxed then what I would have expected from a lab with an instrument that can blind a person, and it really bothers the Ph.D. student because he is the laser safety officer back at his home lab. Basically, it was an argument over rules and procedures, but it was rooted from different backgrounds. OIST is new, and doesn’t have too many regulations to hinder it’s research yet. Eventually it will become more bureaucratic, but that will take a while. In the meantime, it might be hard for a student, who is so used to abiding by a long list of rules to come to a place where many are omitted. He felt it his duty to protect or uphold his own standards of safety. Eventually, we did agree that some of the things that he mentioned were for the best; however, there were a few that Keshav ruled against because they are impractical for research. It would be interesting to see if anything really changes in the lab, but will no longer be there to see it change. I personally like arguments, and I think this one was a good to have. It’s not a good working environment if you do not feel comfortable working in a room, especially if there is a large laser that can blind you before you are capable of closing your eyes. I trust everyone who is working on the lasers, so it wasn’t an issue for me. But a little bit of extra safety couldn’t hurt. By the time that I began working on this assignment, I had already left my lab for my personal tour of Japan, so interviewing my PI is a little difficult. I will discuss however the benefits of being a researcher at OIST because it’s one of the main points when they are selling the University. OIST is set up to be an international intstitution without limitations, and after two months, I’ve seen nothing to prove otherwise. Hired researchers have 5 years to set up a lab to their liking and are free to research however they please. Keshav said that he took this job because other institutions/universities are so strict on their procedures that you’re stuck jumping through hoops. It becomes “What do I need to do to keep this job?”, not “What can I do?” I think the latter makes things more exciting, more driving, and gives room for creativity and imagination. They can hire post-docs/technicians or equipment they want, whatever is in the budget (which is so enormous that the request is almost always accepted). For example, there are 2 multi-million dollar TEMs now because two labs both wanted one but they couldn’t get one with compatible specs and modes. OIST is different from any other place of research anywhere else in the world. It is set-up by researcher for researchers. The management has all been in the field, so they know what works. Creativity, interdisciplinary research, and cross-cultural connections are all encouraged. This week is quite difficult for me to reflect upon my entire Japanese journey because I am in the middle of a week-long backpacking trip across the southern mainland. Tourism is much more exhausting than I ever could have imagined. But the purpose of this week is to reflect on our perceptions. How they might have changed. How we as people might have changed. I’ll begin with this: My views of foreign cultures and the Japanese people, in general, have not changed as much as I expected. I have not been blown away by the changes that I have encountered, and I think its because I was mentally prepared to encounter change. I wanted change; I was excited for it. And if I take away anything, leaning how to approach change with eagerness, rather than fear, is what I have truly held on to. What I have gained from this experience is a feeling of closeness, almost a brotherhood, with the Japanese culture (And I wish to take back some of the customs with me as well because the American way of doing things is not always the best). For example, on a busy escalator, Americans will crowd up the whole thing, so if anyone is in a hurry, they’re stuck behind too many people to get by. On the contrary, Japanese (except in Osaka) will always stand on the right, while others pass on the left. It’s simple and effective. Some frustrations I did have in Japan were using the computers when they were in Japanese. Most of the instructions/symbols were in Katakana, so it could have been worse because I could still read it (very, very slowly). This is just an example of the every day difficulty of switching between two languages. It’s difficult. It just takes time and practice. I’m going to miss the people I’ve befriended here. Soon they’ll be half a world away, and its going to be tough knowing that you may not get the chance to see them again. I’m also going to miss the work environment at OIST. I don’t think I’ve ever been more productive in my life. I am always busy but I always have free time to spend living, whether I’m snorkeling, kareokeing, sightseeing, or salsa dancing. This experience has gotten me more excited for research than I have ever been before. 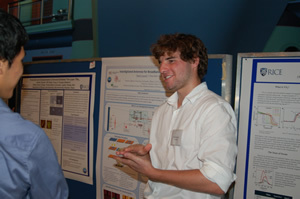 There are so many international opportunities out there for scientist, and I want to travel, and see more the world. I’m soon going to start applying for graduate schools too - maybe OIST will be on that list. Resarch Presentation in Tokyo: The first thing that I would like to say about the Tokyo Terahertz Research Symposium is that it was such an incredible and unique experience. To be in a room with all the other NanoJapan students, host professors, mentors, and other educators was exciting, and to have the opportunity to present was even more thrilling. Re-Entry Program in Houston and RQI Summer Research Colloquium: The re-entry program was a very nice conclusion to the program, because we got to share it with the other NJ students. Handling the culture shock adjustment would be horrible alone. It was nice that we got to come home as a group and stay together a few more days. Also, still having to the RQI to prepare for made us feel like there was still work to be done. The summer was not over just yet. That was also a key component to the success of the re-entry program. I probably would have zoned out through the presentations, mock interviews, and resume lessons without another presentation to look forward to. All of the mentioned divisions of the re-entry program were very helpful as a result. I was motivated to critique my CV, and I now have a much better feeling of how that document will be received by the Graduate School review boards who will be viewing it. I am writing this final review very late and I have already completed one semester back at school since NanoJapan. What was the most difficult adjustment for me was the transition back into mediocrity. I had a ridiculously hard semester during the fall (including four 300/400 level physics classes). I had to accept that I wasn’t the greatest student in the world, that I did have limitations. 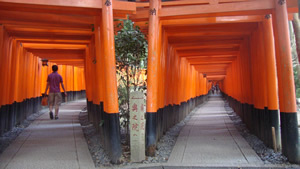 It was a feeling that I had forgotten, because over in Japan, I felt infinite. I felt superior because I had this incredible opportunity and I felt as if I could take on anything. This semester put me back in my place. That last paragraph is not meant to stress that I have no confidence in my abilities anymore. I am applying to some incredibly elite graduate schools because I think I belong there. 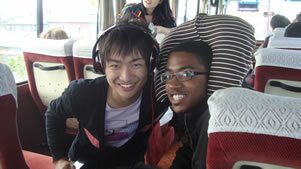 However, the transition back into the same SIU school is difficult once you’ve experienced OIST, Tokyo, and Fuji-san. I have already convinced one girl from my lab to apply for this program, and I really hope she gets it. I’m going to talk to the ENGR 101 class that I used to teach, to encourage those students to apply. I will also talk to our Society of Physics Students RSO to encourage participation- we have our largest freshman class ever and I think there would be a few solid candidates. I just need to give them a pep talk. Okinawa is an island, so it sort of impedes your ability to sight-see other cities. Its pretty expensive to fly to Osaka or Hiroshima for a weekend. What I did was ended my research a week early and went on a backpacking trip for a week. I got a 7-day full JR pass and could ride the train to wherever I wanted. I covered Osaka, Hiroshima, Kyoto, Nagano, and ended in Tokyo just in time to do Fuji-san. I stayed in capsule hotels and hostels along the way. I'm not saying that you have to do this, but it was a lot of fun for me. Travel on the Okinawa Island itself is pretty difficult because there really isn't any good public transport. There is an OIST bus which will take you to campus, your apartment, and to the grocery story. It runs very few times a day. If you want to travel on the island, you'll need a car. OIST has a few that you can borrow, but sometimes they're tough to book. What you will need is an international drivers permit before you leave the U.S. They're incredibly cheap and easy to get, and you will have a tough time enjoying to island without one. At the end of the summer, if you're going to climb Mt. Fuji (an optional student organized hike). Make sure you pack something very VERY warm for that. I made the mistake of believing that I wouldn't need a winter coat for the summer, and I almost contracted hypothermia at the summit. So, be smarter than I.
English is the language at OIST. This does not mean that you should slack on your Japanese homework in Tokyo. You'll want it! First off, you'll impress all of the Japanese workers at OIST. You'll be able to connect with native individuals to the island. And it separates you from the other student interns who are there. You will also be able to take Japanese classes at OIST to help you stay fresh. Have fun exploring! You only have 3 months there so enjoy each second. 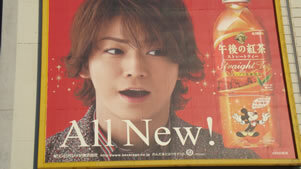 Favorite foods: there is a little raman shop close to the Sanuki Club Hotel. It's called Fukuya, and the best thing there is the Fukuya Hot raman. So good! Must have had it at least 11 times! Also, wasabi flavored potato chips are excellent snacks. 7/11s are your best friend. They have bentos as well as international ATMs. The problem is, there are no 7/11s on Okinawa. Therefore, while down there, you'll have to go to the Post Office to withdraw cash.